As one of the more prominent up and coming Australian brands to have hit the market in recent years, Body War already have a healthy supply of popular products in their line. From their fat burner Body Shred to their pre workout Pre War, Body War have been steadily releasing supplements and tackling their competition head on. One of their latest efforts is the rival product to the immensely popular Green Tea X50 from Tribeca Health. 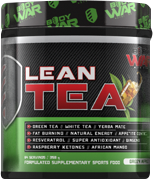 Body War’s version of the product will be known as Body War Lean Tea. Each serving of the Body War Lean Tea is 1g more at 4g than the other two competing brands with each serve containing zero sugar and less than 2 calories. Each tub of the Lean Tea also contains 64 serves instead of the standard 60 of their competitors. Body War have developed a clever strategy of improving upon pretty much every facet of their competitor’s formula. Lean Tea provides ample green and white tea extracts to help support weight loss, metabolism as well as overall health. In addition, they have opted to use popular traditional ingredients to support energy levels and fat loss. For example, raspberry ketones, African mango, Achyranthes aspera and grapefruit seed extract all have studies which offer promise of those ingredients as weight and fat loss agents. Guarana, yerba mate and panax ginseng have also long been used as ingredients to support energy levels, focus and attention, which can be beneficial as these are the facets that decline with dieting and reduced food intake. Body War has always been good with their dosing and have always transparently dosed their supplements, which definitely benefits the company’s image. There aren’t a whole lot of negatives with Body War Lean Tea. While many of the ingredients used are popular in fat loss and weight loss supplements, some of them aren’t backed by as much research as others. For example, there are only a handful of studies showing positive weight loss effects of African mango and raspberry ketones. On top of that, the positive studies also don’t show a huge weight loss associated with those ingredients. This is important to keep in mind, especially if you’re expecting kilos to simply drop off. Lean Tea will be initially available in three flavours including Mandarin, Passionfruit and Green Apple. All of Body War’s previous supplements have mixed well with very little residue, clumping or grittiness and Lean Tea is no exception. Body War’s Lean Tea is one of their best tasting supplements to date and should prove popular with fans of the Tribeca and BSc Body Science versions. Body War Lean Tea is a direct attack on Tribeca Health’s massively popular green tea supplement and while they’re late onto the game, this shouldn’t detract from their standout formula. If you’re after a good hydrating drink that can help to support your weight loss journey without necessarily overloading your system on stimulants, then Lean Tea is the supplement for you. 3. Rani N, Sharma SK, Vasudeva N. ‘Assessment of Antiobesity Potential of Achyranthes aspera Linn. Seed.’ Evid Based Complement Alternat Med. 2012;2012:715912.